Amboseli Safari (3 days, 2 nights): US$ 1250,- / Single Supplement: US$ 330 -> LODGE Safari / quite nice resort with view of Kilimanjaro. Please Join Us During: January, February, March, April, July, August, September, October, November, and December. Leader: Felix Berg, experienced organizer - leader of treks & climbs in Africa & the Himalaya. Trips offered twice each year: 14 February-2 March or 1-20 August. Can't go on the scheduled dates? We now have custom trips available for your group . Recent News: Please Click here to view recent news and pictures of our expedition to Kilimanjaro and Mt. Kenya where our team enjoyed a lot of fun and success with summits on both mountains. Please also visit our "Archived News" for more stories of past trips. Kilimanjaro is the highest peak in Africa at 5,895 metres/19,300 feet, is located in Tanzania; an easy and beautiful 9 day trek that offers something for everyone and is a rare opportunity to reach the summit on the uncrowded Umbwe walking route . Kilimanjaro National Park: At the base of the mountain, the environment is beautiful and lush jungle, inhabited with wild birds and animals. As you trek up the mountain, the foliage changes and becomes more alpine. 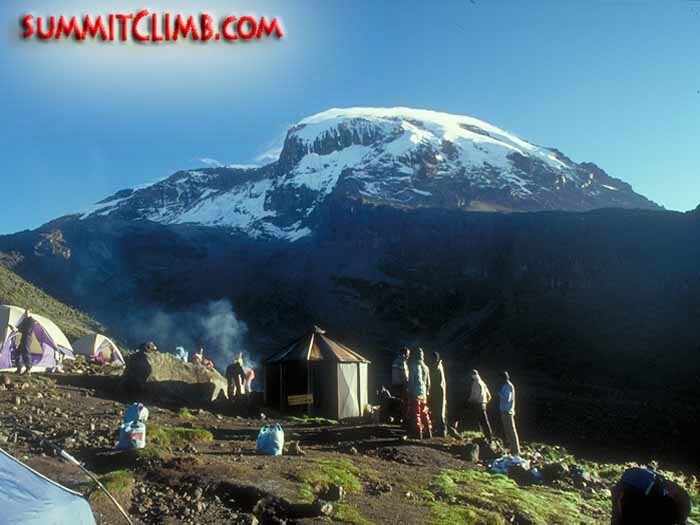 Arriving at the summit, you behold an active volcanic crater and small glacier. The Ngorongoro Lake Manyara Safari: Located in Tanzania's Ngorongoro National Park, it is often referred to as the "Garden of Eden"; two days of exploring a wide open grassland dotted with accacia trees and a plethora of big game near the deep Ngorongoro volcanic crater and Lake Manyara. National Park: Famous for elephants, hippos, giraffes, rhinos, wildebeasts, zebras, gazelles and hundreds of exotic animals and birds. The site of a deep volcanic crater and the world's largest unbroken caldera, Ngorongoro Crater is the best self-contained safari destination in the world. Appreciate the increasingly hard to find sights and sounds of the unspoiled African bush, away from other tourists. Leader and Staff: Our friendly and expert driver will lead us in a purpose-built land-rover, a very safe and good vehicle for easy game viewing, through the rooftop, of wild animals inhabiting one of the most majestic landscapes in the world. During our safari, our experienced guide is with you all of the way. Our skillful cooks prepare delicious, fresh, tasty food and hot drinks at least 3 times a day. The helpful staff are there to ensure you can relax and enjoy the trip. We encourage men and women from around the world, of all ages to join us as an individual team member or with your own group , whether that is your spouse, partner, friends, sibling, clients, colleagues, etc. Most of our members join as individuals, our team dynamics work well, and we are able to build successful and safe groups of people that enjoy trekking, climbing, and safari-ing together. It would be nice if you have some experience with foreign travel, although we are happy to advise and help you if this is your first time out of the country and for many of our members it is. It is not necessary to be in extremely good shape to enjoy these treks. If you can have fun walking for 3-6 hours up and down hills with a few 20 minute breaks mixed in, then you can easily accomplish these treks. Please "click" one of the links on the column on the upper right of your screen under "Kilimanjaro trekking" to learn more about our expedition. *Hotel upgrade, single rooms and single tents are possible against modest surcharge. Full Service Cost $4950 (with Amboseli 2 day safari) or $5550 (with 4 day Serengeti safari). Full Service Cost: $2950 USD. Full Service Cost: $1850 USD. 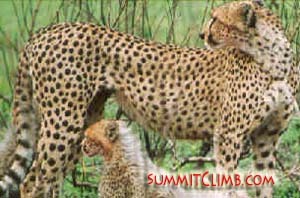 b) $1200 USD (Serengeti 4 day safari). All costs are for groups of 6 or more. For smaller groups, a 25% surcharge may be applied. Extra costs for Summitclimb western leader and guide: $5500 USD fixed per group. You can always join us on a trip to Mount Kenya. If we do not have six or more members signed up – unfortunately that is the case up now- we can still run the trip with a 25% surcharge . That makes a cost of $1950 USD per person. For groups of 4 to 5 we run the trip with SummitClimb leadership as advertised. *Felix, our man for Africa, trains the KWS (Kenyan Wildlife Service) mountain rescue team. 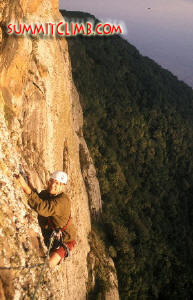 He recruits the best rangers as technical guides, who then lead the tours and the climbing on Nelion an Batian. Equipment Transport: Our expedition includes transport of all of your equipment from Nairobi to our destinations, and returned to Nairobi. While trekking and climbing on the mountain, we DO NOT ask our full-service members to carry heavy group equipment (although it is an option if you really want to), such as tents, rope, fuel, food, etcetera. We employ porters to carry group equipment and supplies. Cooks and Food: On the trek our skilled trekking cooks provide delicious meals. Our skillful and hard working cooks prepare three hot meals each day with a very healthy diet of fresh vegetables, cheeses, eggs, and fresh as well as tinned fruits, meats and fish (all meats and fish are prepared separately out of respect for the vegetarians in our midst). They supply you with unlimited hot-drinks, the key to successful acclimatization. On the mountain we provide you with abundant and nutritious locally available quick-cooking food, so that you may prepare at least three meals and lots of hot drinks each day, in our specially designed high-altitude stoves using our butane-propane expedition mix fuel. Group Equipment: We provide a plethora of top-quality, and time-tested equipment, group gear, and supplies, including: rope, ice, rock, and snow anchor protection; basecamp, advanced basecamp and altitude tents; cookers, fuel, high-altitude food, walkie-talkie radios, bamboo marker wands, etcetera. Please see the above EQUIPMENT link, to study what we bring for your use and safety. Please consider adding a trip to Rwenzori, "Mountains of the Moon" , if you wish to extend your African adventure. High end relaxation after the mountain? 4) Afternoon flight back to Nairobi or Kampala. 3) Breakfast and departure for a full day game drive discovering the beauty and abundance of wildlife permanently residing on the crater floor until 3:00 p.m. and then drive to respective destinations. Luxury Lodging Single: Available upon request. From the hotel or the lodge we take a private bus through a region with lush vegetation, coffee and banana plantations on the north side of Kilimanjaro. Through forest area we continue to NaleMoru, the starting point for the ascent. A narrow path along the corn and potato fields into forests and with some luck we can observe wild animals there too. Finally, we leave the forest belt and reach the camp in the transition from the forest into the moorland near Rongai cave. Driving time approx. 3 hours, walking time about 3-4 hours. Overnight tent / VP (2600m). Evenly the path pulls up to the second cave at around 3450m, the caves are formed of lava. After lunch we leave the main path and walk through the moorland towards Mawenzi. Finally, we reach the camp near the KikelewaCaves .Staying overnight in a fascinating setting in the sheltered valley. Walking time 5-7 hours. Overnight tent / VP (3600m). Day 4 • Kilimanjaro Trekking - Mawenzi Tarn. Today's stage is indeed steep, but short. Grass covered slopes leading to a high-altitude, practically devoid of vegetation zone. The fantastic panoramic view rewards the effort of the climb to camp near the Mawenzi Tarn, a small lake at the foot of the dominant crags of Mawenzi, the 5149m high neighbouring Kilimanjaro. Walking time 3-4 hours. Overnight tent / VP (4300 m). Day 6 • Trekking Kilimanjaro - School Hat. A wide, desert-like and resembling moonscape plane crosses the saddle between Mawenzi and Kilimanjaro to the next camp at School Hut. In the afternoon, the equipment will be placed ready for the day and everything prepared. We go to sleep after an early dinner then shortly after midnight we wake up and head for the summit. At midnight, it means getting up and marching off. The summit day is the steepest and most demanding part of the Tour. In the light of the headlamp the group sets off and you'll be accompanied by the local guides and the expedition leader who communicate with each other in radio contact. Thus, where appropriate, individual groups are formed, which run their own pace. The terrain via a gravel road and gets steeper upwards, rising laborious. Taking 4-6 hrs. To Gilman's Point at 5685 m, at the summit crater, then the terrain is flat just another 200 meters of altitude taking about 1-2 hours to the main summit, the Uhuru Peak on 5895 meters, the highest point in Africa. The wide, wonderful view rewards us for the ascent hardships. Because of the early rise we have the best chance of a good foresight. The descent to Kibo Hut at 4700 m and, after a short rest, the Milenium or Horombo Camp comes with decreasing height amazingly fast. Despite the long, but not very strenuous descent remains time, landscape and flowers to admire and photograph. Back at Marangu Gate it's time to say goodbye to guides and porters. Afterwards we drive to the hotel and you will be rewarded for the summit success with a certificate of the National Park. Walking time approx. 3-4 hours, takes about 1 hr., Hotel (UEN / F). Below is a detailed list of clothing, shoes, equipment, and other items you need to bring for Kilimanjaro, Mt Kenya, and Safari. At the bottom is a description of team equipment we bring for you (click link below to go directly to that section of the personal equipment list or just scroll down). When you fly to Africa you can bring as much as the airline will allow. On trek, your bag is going to be limited to 18 kg/40 pounds, but you can store the remainder of your items at the hotel. Weather-In town and on the safaris the weather is usually very comfortable. In general the evenings are between 10-15 degrees Celsius or 50-60 Fahrenheit, with days sometimes around 25 c/80 f.
Weather Conditions near the base of the mountain tend to be tropical to semi-temperate and are relatively stable all year round. The lower plains are hot and dry with average temperatures of around 30 c/85 f.
Higher up the mountain, temperature extremes tend to be far more drastic and the variation between daytime and night time temperature becomes more and more apparent. At night the temperatures at most camps drops to around freezing, sometimes below. 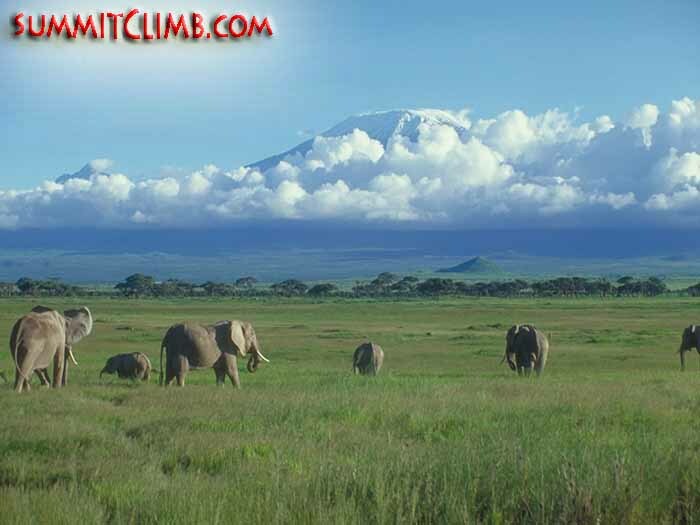 Once the sun comes over the peaks it usually warms up to a comfortable 15-20 c/60-70 f.
Please go to our personal & team equipment section of the "Kili/Kenya/Safari Questions" for additional information and detailed discussion of the equipment lists below. Please " rel="noopener noreferrer">"click here" to view our list of recommendations on where to purchase kit from our Kili/Kenya/Safari Frequently Asked Questions. 1 pr thin polypropylene liner glovers. On the mountain we supply 3 meals each day. This food will consist of soup, local cheese & sausage, biscuits, dried noodles, potatoes, rice, porridge, butter, dried and tinned vegetables, fruit, meats, and fish, tea with milk and sugar, coffee, powdered juice drink, and drinking chocolate. Our porters will carry this food so you don't have to. Organizer: During this full service expedition you will benefit from the leadership of Felix Berg , proficient technical climber and mathematics student who lives in Freiburg, Germany, and Nairobi, Kenya with his wife, who is a Kenyan and from a well established old family, as her father is the Kenyan minister of elections. Felix is fluent in Swahili and has climbed and trekked Mount Kenya and Mount Kilimanjaro numerous times, and was the co-leader of our 2002 Kangchenjunga expedition and Everest-Tibet 2004. He is a very well organised person, and a strong climber, with good ideas, always eager to help others. He has made solo winter ascents of major North Face Routes in the Alps. Felix met SummitClimb, when he made an impressive no-rope ascent and descent of Ama Dablam with a German-Japanese expedition in 2001, then became a leader in training on Kangchenjunga and improved his leadership skills on Everest-Tibet 2004. Felix has his own website you might enjoy visiting: www.BergBote.de . Please be sure to return here when you are done. Photo right: Felix, one of our great Africa leaders, and team member Sylvia, practicing on a boulder before our ascent of Mt. Kenya (Arnold Coster). Guides: We have highly experienced and friendly African guides to support us along our trek and optional rock climb, as well as safaris. These trustworthy and helpful professionals are there to assist the group on the approach trek and on the mountains, make sure everyone is enjoying themselves, and support us safely to our destinations. Porters: All of you equipment is carried by porters, so you don't have to carry a heavy ruck sack. You will only need to carry a day-pack during the trek. Cooks: Skillful cooks prepare all of your meals during the trek and climb, using fresh, local ingredients. For more about where we will stay and what we shall eat, please click here . Our friendly guides and trip leaders are experts at leading interesting groups of men and women of all ages from around the world. In addition, they have an intimate knowledge of the local people and customs in each picturesque village you stroll through. We must also give credit to our polite and highly experienced, hard-working local guides, trekking porters, cooking, and office staff. Many of these excellent guides & porters who work for us have an intimate knowledge of the beautiful treks on Kilimanjaro and Mt. Kenya and the comfortable areas we will visit, as this is their home region. They live in this land, grew up here, and have family and friends in the fun areas we will pass through, making our visit less of the usual tourist experience and more involved with the unique and authentic culture of Africa. They go out of their way to help make your visit remarkable, enjoyable along the way, and create lasting ties with the majestic landscapes and the inhabitants who reside there. This is a truly wonderful trek with an enthusiastic and polite group of friends. Our leaders and staff look forward to serving you on our expeditions to form a successful team and create a rewarding experience. What questions do you have? Please ask as many questions as possible. This helps us to have a proper conversation so we can better understand one-another's expectations, so you will have a very safe, enjoyable, and successful expedition. Thank you. 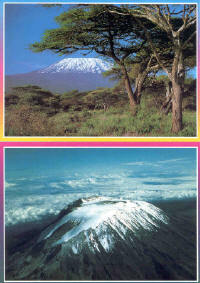 Before completing the application forms, please be sure to carefully study the Kilimanjaro, Mt. 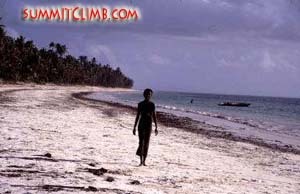 Kenya, & Safari "Questions" website for information regarding flights, payment, team members, application forms, insurance, etcetera: Kilimanjaro/Kenya/Safari Frequently Asked Questions . Note: If you plan to participate in the optional Mt. 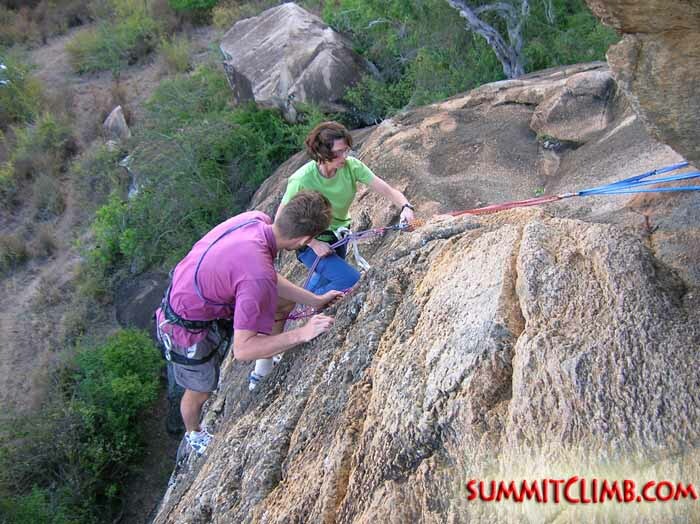 Kenya rock climb instead of the high altitude circuit trek, please fill out the climbing application below instead of the trekking application. Thank you.